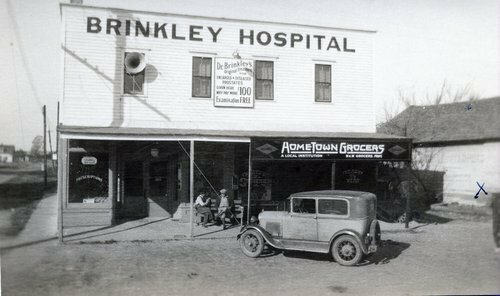 A photograph showing Dr. John R. Brinkley's hospital located above Ralph E. Lake's drug store and a grocery store in Rosalia, Kansas. The hospital was located across the street from Dr. Owensby who started a hospital in an empty hotel. Brinkley was in direct competition with Owensby, so he installed speakers on the outside of his building, directed them at Owensby's hospital, and broadcast his daily programs. Also, Brinkley posted signs on the building advertising his prices and services.